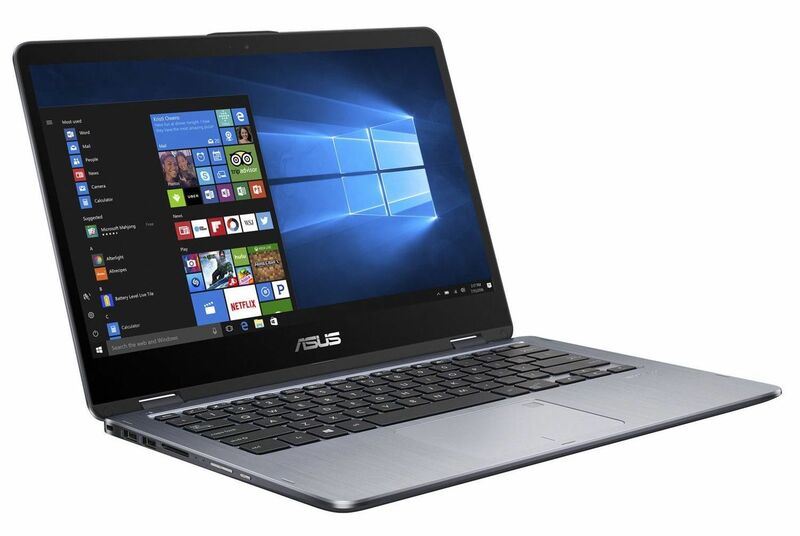 Asus returns with a new version of its 14-inch multimedia convertible, the Asus VivoBook Flip TP410UR-EC149T, enriched with the latest generation of Quad i5 Kaby Lake Refresh processor with substantial resources. It also contains a valuable hybrid storage of 628 GB (128 GB SSD), 6 GB of RAM and a beautiful touch screen full HD IPS and rotary screen with refined borders, not to mention its dedicated graphics card GeForce 930MX. What’s more, its elegant and discreet shell combines with a backlit keyboard and a fingerprint reader for more convenience. 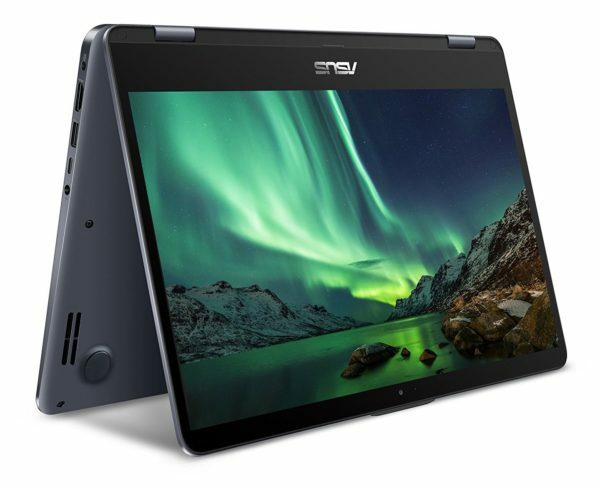 Asus takes care of the design of its VivoBook Flip TP410UR-EC149T, which is housed in an aluminum chassis with structured edges and a sober look. The gray that dresses the entire case is all that is neutral but Asus refines the quality of assembly and comfort surfaces. Point of view measurements, the report is good for a 14 inches nomad with a reasonable weight of 1.6 kg and a relative finesse. In addition, the addition of a backlit keyboard is beneficial for typing in a dark atmosphere, especially with its nomadic vocation. Designed for mobile play, the ultrabook is characterized by its convertible configuration. Thanks to 360 degree rotating hinges, the screen will be able to adopt several positions: opposite for normal use, flat, in tent mode or in the easel function. 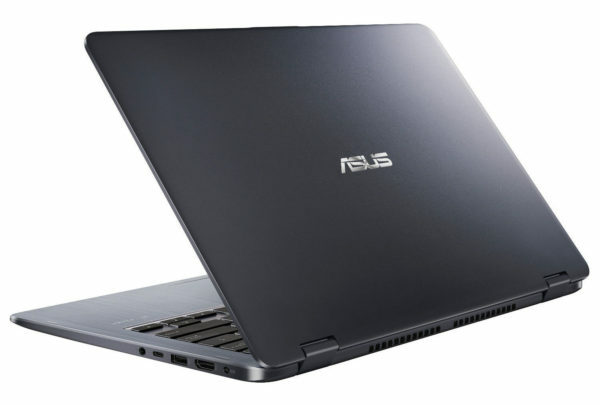 The size of its battery may be reduced (42Whr), the endurance of the Asus VivoBook Flip TP410UR-EC149T is honorable. And for good reason, it should be around 10 hours in Internet browsing with active WiFi. Behind a design that prefers discretion, the ultrabook hides a good level of performance allowed by the arrival of the Quad Core i5-8250U Kaby Lake Refresh last generation. Thanks to him and the 6 GB of RAM that support him, the ultrabook is able to fly over common use (Internet browsing, Office pack, video playback) and enjoys a range of action for more demanding missions (edition especially), provided you master the multitasking. Indeed, we consider that a total of 8 GB of RAM is more favorable at the moment if you are tempted to multiply tabs and active applications. However, we gain fluidity compared to a configuration with 4 GB of RAM. Another decisive point here, the screen makes its small effect with its refined edges offering an amplified immersion (NanoEdge). Its Full HD resolution (1920 x 1080 px) will be ideal for reading your High Definition content thanks to its high display density while the IPS panel will take care of opening the viewing angles (on 178 degrees according to Asus) and faithfully reproduce the colors. In addition, the glossy touch surface will allow a fun interaction with the system but its visibility outside will be altered by some reflections. The graphics part is entrusted to an entry-level solution, the GeForce 930MX. In condition, it does not play properly in Full HD, if not very undemanding titles. On the other hand, it will be able to launch the majority of the games of the market in standard definition (1366 x 768 pixels), with adaptations on the level of details under the demanding opuses. On the storage side, the ultrabook welcomes a hybrid solution that puts the emphasis on responsiveness without sacrificing space. In principle, the 128 GB of the SSD will contain the operating system and part of the programs / games while the 500 GB hard drive takes care of the storage of your toy library, thus ensuring efficient overall execution, phases of development. turn on / off and fast data copies. Finally, the connector provides all the necessary in standard formats. There is an SD card reader, an HDMI output and no less than four USB ports including a USB 3.0 and USB 3.1 Type-C. A fingerprint reader is added to the batch to allow easy and safe access to its session (Windows Hello compatible). The latest generations of WiFi AC and Bluetooth 4.1 modules are also planned for ever faster and more reliable wireless data exchanges.